Drew Brees, like most every other NFL-adjacent person, has weighed in on Colin Kaepernick’s national anthem protest. Brees has echoed a common line: He’s fine with Kaepernick protesting for what he believes in, but has an issue with him using the American flag (which he called “sacred”) to do so. Brees is either missing or choosing to ignore a very basic point here: Protest, by its very nature, must be disruptive to be effective. If Kaepernick truly wants to instigate change or at least shift the discourse, doing so in a clear, public manner is much more effective than protesting in a way that’s convenient to everyone. What’s more interesting here, though, is Brees’s implicit position that his relationship to performative demonstrations of patriotism, which involves taking part in them to promote causes he supports, is definitionally the only valid one. 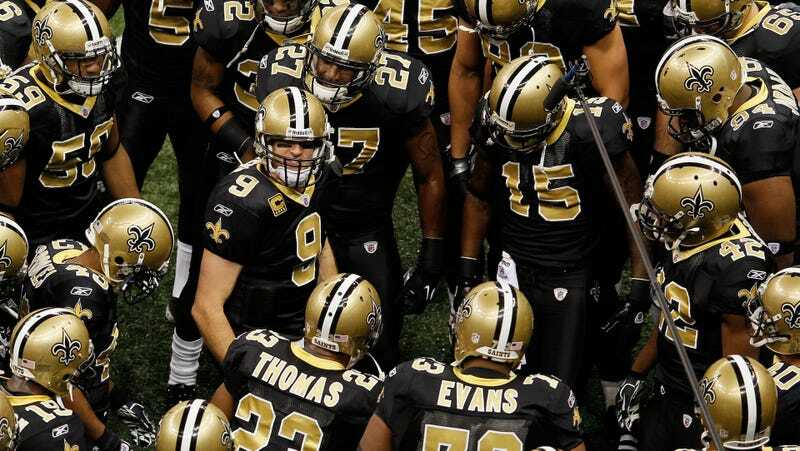 Consider that Brees came up with his famous pre-game huddle chant while visiting U.S. Marines at Guantanamo Bay—a global symbol of human-rights abuses—in 2009, part of a career-long pattern of branding himself as an unwavering supporter of the flag and the troops. Further consider that his overt support for the military on national television has undoubtedly contributed to the size of his public profile, especially since it’s amplified by a football media eager to echo the NFL’s close, profitable relationship with the military. His public image is based in part, this is to say, on willingness to appropriate military iconography, just as Kaepernick’s is based in part on a willingness to reject it. To Brees, the flag and the national anthem are powerful symbols of important values; clearly, they’re the same to Kaepernick. Both of these men are making clear their opinion of the way these symbols express important values through the way they treat them; both are speaking out and drawing attention to what they believe in through their actions; both seem to have reasonable positions; and yet only one is proclaiming his choices the only ones a decent person would make. One might wonder why that is.